The oldest National Park in the USA (and even the world) is primarily known as a wilderness wonderland of fantastic landscape features and rich wildlife. But the spectacular geothermal features such as geysers, hot springs and so forth are indicators of something below the surface that has gigantic destructive potential. Yellowstone is actually the world's largest “supervolcano”. If there was to be another super-eruption again (unlikely as it is), it could alter the atmosphere and threaten life not just locally but globally. In that sense, then, it can also be seen as a (potentially) dark tourist attraction. More background info: Yellowstone sits atop a volcanic hotspot (cf. Volcanoes National Park, Hawaii) that has seen at least three prehistoric super-eruptions, 2.1 million years, 1.3 million years and 630,000 years ago, respectively. If this is to suggest a pattern, then Yellowstone appears to be “due” for another big one. And 'big' in this case means absolutely super-gigantic. The last super-eruption that formed the current 35 by 50 miles (55 by 80 km) Yellowstone caldera (a depression formed by the collapse of the emptied magma chamber) ejected an estimated 240 cubic miles (ca.1000 cubic kilometres) of material – rock and ash mainly. For comparison: the 1980 explosion of Mount St Helens, the largest volcanic event in the USA's recorded history, ejected a “mere” one cubic mile of material. Recent measurements revealed that the current magma chamber underneath Yellowstone is a lot larger than previously estimated. And new dome growth has moved the caldera floor upwards by several inches annually during the 2000s, but this seems to have stopped for the time being. All this provided fodder for hyperbolically over-dramatic media reports, basically saying the end of the world may be nigh – but the volcanologists of Yellowstone Volcano Observatory are actually quite cool about it. According to them, the volcano is not overdue for another super-eruption, which it may no longer even be capable of producing at all. At the same time, smaller volcanic events, even lava flows, are still likely to occur again – but no significant such event is expected for the next ten to hundred years. The last significant lava flows occurred 70,000 years ago. More likely are hydrothermal explosions, which have created their own craters in historic times, and earthquakes remain a constant hazard. In 1959 a tremor of the sizeable magnitude of 7.5 on the Richter scale killed 29 people and caused considerable damage in the park, also altering its geysers' behaviour while at the same time creating altogether new ones. So while Yellowstone does not seem to threaten the world with an imminent super-eruption that could kill billions and affect the global climate, it is still a hazardous volcanic area. And a major event cannot be ruled out altogether for the future. It's just not very likely any time soon. Yet, even just “potentially dark” still has some dark attraction to it, and that's why Yellowstone is included here. (A similar reasoning also applies to Cold War sites; that conflict never actually turned hot – but it could have done so, which is why associated missile sites and such like are still dark-tourism attractions). The Yellowstone National Park was established in 1872 – long before it became the tourist attraction it is today. It is in fact the oldest such institution – and has been called “America's best idea”. It's one of the last intact ecosystems in the temperate zones on planet Earth. Bears, moose, elk and bison roam freely here in significant numbers. And even wolves have been reintroduced. Some of this healthy wildlife population, however, poses risks for human visitors too. Grizzly bears in particular can be dangerous, even deadly. On average one human has been killed by a bear annually in Yellowstone in recent years. So being “bear aware” is essential, especially when heading off well-trodden paths and camping in the wild – see under dangers below! The National Park is huge – almost 3500 square miles (9000 square kilometres), with hundreds of miles of roads and trails. It sits within the Rocky Mountains at a mean elevation of over 7000 feet (2000m). This also means winters are harsh and long here. Parts of the park and its roads close seasonally, but apparently winter visits are popular nevertheless, offering activities such as snowmobiling. In total, the park receives over 3 million visitors per annum! What there is to see: lots, though nothing much that is in itself really dark – there are just indicators of the volcanic potential brooding underground. Yellowstone National Park has about half the world's geysers as well as numerous other geothermal and volcano-associated features, such as hot springs, fumaroles, mud volcanoes, and also old lava flows. Probably the most fabled of spectacles in Yellowstone is Old Faithful Geyser, which has been erupting regularly since it was discovered by an expedition in 1870. It gets its name from its incredible regularity of eruptions: every 65 to 90 minutes it will blow off for between 1.5 and a full five minutes. It shoots a vertical spout of boiling water into the air between a 100 feet (30m) and nearly 200 feet (60m) tall. Steamboat Geyser in the Norris Geyser Basin can be even more dramatic and is currently the tallest geyser in the world at a peak height of ca. 300 feet (90m). Eruptions can also last much longer (up to 40 minutes) and include lots of steam venting in addition to water. However, this geyser lacks both the predictability and regularity of Old Faithful. It only blows off erratically and quite rarely, often not at all for years. So most of the time you will probably see nothing. Yet more geysers can be found in the Upper, Lower and Midway Geyser Basins north of Old Faithful as well as at West Thumb by Yellowstone Lake. Firehole Lake Drive is possibly the best section of scenic drives in Yellowstone for its concentration of a wide range of volcanic features. Not only are there smaller, regularly spouting geysers, also fumaroles (steam vents), hot springs, mud volcanoes and the odd Fountain Paint Pot, a mudpot of clay and minerals that looks like liquid paint. The prettiest feature here are the deep-blue hot springs (like Celestine Spring) where you can gaze into the abyss through crystal-clear hot water. The superstar of all hot springs, however, is the Grand Prismatic Spring. Not only is this the largest hot spring in the world, it lives up to its name through the display of a range of colours like light sent through a prism – from deep blue in the centre of the hot lake, to green, red and yellow tones, some of which are brought about by beds of thermophilic bacteria that thrive in this otherwise hostile-to-life environment. The latter is made evident by all the dead trees you can see around some of these geothermal features (especially at the Fountain Paint Pot Trail). These were once pioneering plants but were killed off when the nearby hot springs shifted and silica penetrated the trunks. Yet more dead trees can be seen in parts of the park that suffered from more recent forest fires, still standing but charred black and lifeless. Another star feature, and a very different type of hot spring, is Mammoth Hot Springs in the northern part of the National Park (and actually outside of the Yellowstone caldera). These are a system of sinter or travertine terraces like the ones at Pamukkale in Turkey or the Pink and White Terraces in New Zealand that were destroyed by an eruption of Mt Tarawera. Also in the northern part of the park you can find traces of ancient lava flows visible on steep cliff-sides and even petrified trees, i.e. trees that were engulfed by prehistoric eruptions. But most other highlights of the National Park are not of a volcanic or geothermal nature, such as the Grand Canyon of the Yellowstone River and its waterfalls or Yellowstone Lake, the highest elevation lake in the USA at over 7700 feet (2350m) in altitude. 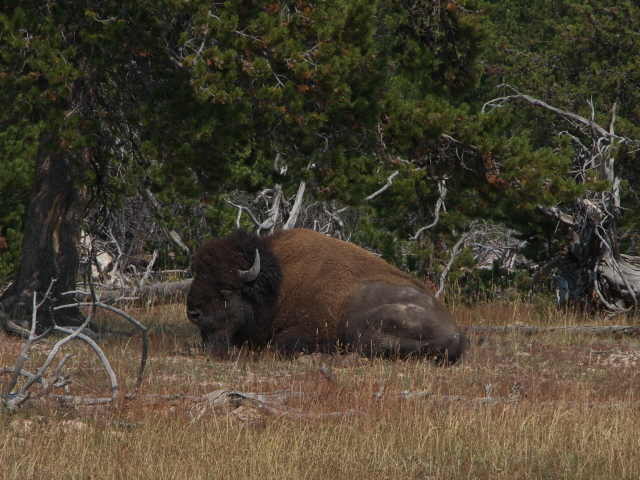 And then, of course, there is the abundant wildlife in the Park, including bison, wolves, elk, moose, and bears. Especially the latter can be dangerous, though, so keep your distance and be “bear aware” – see the special dangers section below! Location: in the north-west corner of Wyoming, USA, with some smaller areas also stretching into neighbouring Montana and Idaho. Access and costs: Quite remote, involving a lot of driving, relatively high park fee, but not disproportionate given how much you can get for it. Details: The National Park has five entrances, one to the north, one to the north-east, one to the west, one to the east, and one to the south. Only the former two are open year-round, the other three close seasonally between November and April or May. The same applies to some of the roads within the park as well as to lodges and visitor centres. So, for seeing as much as possible and without needing special winter gear, the best time to come is in the summer or early autumn, although in winter the geysers and other geothermal features produce more spectacular steam shows, which can be a bonus. Entrance fees: 30 USD for a private (non-commercial) vehicle including driver and all passengers, 25 USD for a motorcycle (or snowmobile), 15 USD per person when arriving on foot, by bike or on skis etc. (under 16-year-olds free) – an annual pass for Yellowstone is only 60 USD, and annual “Interagency Pass” (for all National Parks) is 80 USD (10 USD for seniors, free for persons with disabilities and members of the US military). There are also several operators of guided tours and vacation packages in the park that can include excursions by bus or, in winter, snowcoach or snowmobile. When driving around in your own vehicle, be aware that wildlife has priority – and you do indeed often get bison or other animals on the road causing traffic jams. Be patient. Do not stop for viewing wildlife by the roadside and park only in designated spaces or pullouts. Observe the speed limits! When hiking into the backcountry, special permits may have to be obtained, and specific regulations apply, also for camping – make sure to research all this in advance. And see also below for the special “dangers”section. Accommodation within the National Park is provided by several lodges, many historic, including first and foremost the Old Faithful Inn, which is also a National Historic Landmark. Constructed in the early 1900s in the rustic resort architectural style, it is now one of only a few log hotels still in service. 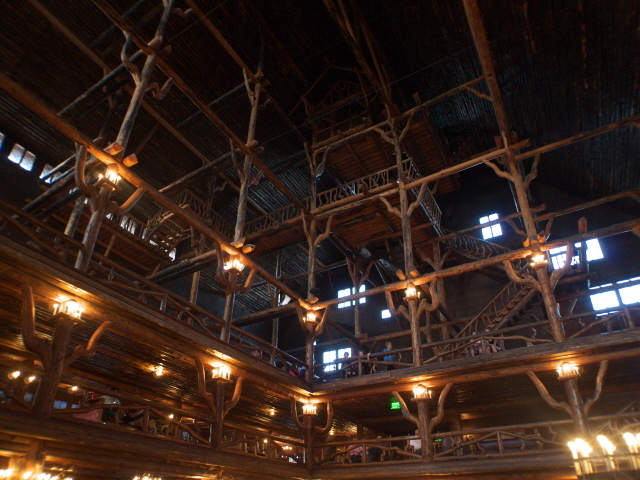 It is claimed that it is in fact the largest log building in the world (and certainly the largest log hotel). Due to its fame and location right opposite its namesake geyser, the top attraction in the park, the Inn is very popular, so book well in advance. There is also plenty of accommodation just outside the park's boundaries, but staying in one of the historic lodges always adds that little extra. Dangers: Wildlife watching is one of the key attractions in the park, but it comes with some risks, especially with regard to bears! All food and rubbish must be stored in bear-safe containers. Bears must never be fed! Bears who get accustomed to humans and human food will become especially dangerous and the Park Service would have to shoot them – so the rule is not just for your own safety, but also for theirs! You are encouraged to make your presence known when hiking in bear territory, by walking and talking loudly enough. Thus forewarned bears would normally avoid contact. In general be “bear aware” – look ahead and try to see a bear before the bear sees you. Never approach a bear. Nevertheless it is recommended that hikers carry “bear spray” (a kind of pepper spray) to fend off a charging bear should it be necessary. If you spot an animal carcass, don't get near it but retreat. Chances are that it could be one or even several bears' dinner which they would defend against your intrusion. Female bears with cubs are also especially defensive of their offspring and you must stay clear of them. There are instructions regarding how you should behave should a bear encounter turn nasty all the same and you do not have anything to defend yourself with. Some parts of these instructions seem very hard to follow. First of all: never run. Bears are opportunist omnivores and running from them would only trigger their hunting instincts. And don't think you could outrun a bear! In case you do get involved in a close-contact bear encounter the advice is to roll up in a ball and protect one's neck and stomach, and only fight back if the bear persists in his attack. Again, showing signs of panic, like screaming or whimpering, would only re-enforce the bear's killing instincts. Better not to get caught up in a bear encounter at all then. While bears are the most dangerous animals in the park, they are not the only ones that can do harm. Wolves pose practically no risk to humans because they are elusive and keep their distance, but moose, elk and bison might pose risks. Bison (buffalo) in particular are often seen in open clearings, by rivers and even right on the road. Always give them priority. Never approach them on foot closer than 25 yards. They can be unpredictable, and in addition to their sheer size and weight they also have potentially lethal horns; moreover: despite their often docile appearance, they can run extremely fast. More people get hurt by bison in the park than by bears! The very greatest risk, however, is getting lost or injured when hiking into the backcountry – and especially when not having sufficient equipment and supplies, this can also be a risk to your life. Every year major search and rescue missions have to be undertaken. Most visitors stay on the roads, scenic drives and easy and safe enough walking trails and are thus at very little if any risk. But even then, there have been cases of careless visitors getting scalded by hot springs after wandering off the prescribed boardwalks and trails. Just don't. Time required: anything between a single day and forever. A single day would suffice only to see a selection of key attractions in one area of the park (such as the geyser basins in the south-western part of the park), but to do all the designated attractions, or even just the top-10, you will need several days. For real wildlife and nature enthusiasts, any time-limited visit will be too short. Combinations with other dark destinations: nothing in the more immediate vicinity. The closest other location listed here would be Butte, Montana, which is a ca. 165 mile (265 km) drive away from the Park's north entrance along Highway 89 and Interstate 90. For everything else see under USA in general. Combinations with non-dark destinations: Yellowstone National Park is in itself primarily a non-dark attraction, and one of the USA's top destinations of them all (with over 3 million visitors annually). But for good measure there's another National Park almost adjacent to Yellowstone to the south: Grand Teton National Park. Around the park's boundaries there's plenty more mountainous scenery. The nearest larger cities are to the south, Salt Lake City in Utah and Denver, Colorado, reachable within a day's drive.